INTERACT. A participant in the seminar-training raises a question to Prof. Abigail Rustia, January 10. 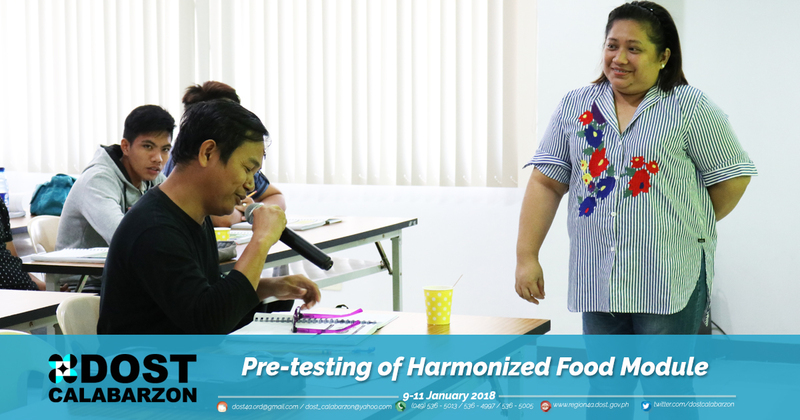 After a year of brainstorming, analysis, evaluation, and consultation, the primary version of the Harmonized Food Module on Food Hazards and Good Manufacturing Practice (GMP) was officially rolled out through a seminar-training held last January 9-11 at DOST CALABARZON regional office. Through the collaboration of DOST CALABARZON and its consultant-partner, the UP College of Home Economics (UP CHE), almost 25 representatives of diverse food manufacturing micro, small and medium enterprises (MSMEs) in the region got the chance to be part of the first batch of participants in the seminar-training. The three-day event focused on three main topics namely: basic food hygiene, food safety hazards, and current good manufacturing practices. Dr. Alexander Madrigal, DOST CALABARZON's regional director, emphasized in his opening remarks that technological support and enhancement are DOST's main contributions in the propagation of compliance to the Food Safety Act. He also noted that this seminar training is a product of the agency's project on food safety program, specifically on the development of a harmonized training module. Professor Abigail Rustia, Professor Melissa Siena, and Ms. Wendy Ledda, representatives of the UP CHE, served as the facilitators for the event. They combined discussion, individual activities, and group activities to have a good mix of shared and applied knowledge. As the participants were asked regarding their experience, Medalyn and Myralen Ema, sisters, newbies in the field, and representatives of Kenso and Kloe's Natures Farmsaid that this seminar training helped them better understand hazards and the importance of proper sanitation. On the other hand, Julius Galang of Vegetari Vegetarian Products, said that he already had the chance to attend a similar event before. "This seminar-training served as a refresher for me." Galand added as he noted that his capacity to explain specific details especially on retention sample and receiving of raw materials was further developed. According to Ms. Ledda, one of the event facilitators, this has been a fun event for her as the participants seem to appreciate the seminar-training. She also noted that this seemed applicable to all participants regardless of experience, as new and up-to-date information were presented. Ledda also expressed her excitement for the upcoming official launching of the finalized module. As this three-day event served as the pre-testing stage, the participants' comments and suggestions will be taken into consideration as another session of analysis and revision begins. The final version of the harmonized food safety module is scheduled to be officially launched this year.
" WIPO Inventor of the Year 1995 Edgardo Vazquez brought home the Gold Medal for the modular housing called Vazbuilt. This is a system for building fire-, termite-, typhoon- and earthquake-proof houses in less than a month using prefabricated posts and panels. Engr. James Reamon also took a gold from the WIPO in 1984 for his Jimbo Ventilation System. "